For 69 years the government and military have been avoiding telling us the real facts about the 1947 Roswell Incident and what actually transpired back then. Three things that are inevitable, I suppose, are time, change and progress; and to me, it appears as if all of those are becoming part of the 1947 Roswell Incident. Time, primarily due to the fact that many of the first-hand witnesses some of us have known for years are no longer with us, due to their senior age taking its toll on them to the grave, and I understand that will eventually be all of our demise. For me, I truly miss some of them due to the relationships I had with them the past 20 years doing Roswell research. Change, because it is sometimes necessary, while at other times I have to wonder if the change was really beneficial or needed. Progress could be a means of developing improvement, or moving forward, however, I don’t always agree with that description either. I’ve seen many changes and improvements over the years which I’m not sure should have been classified as progress. Add to the above three terms the fact that for 69 years the government and military have been avoiding telling us the real facts about the 1947 Roswell Incident and what actually transpired back then. I can’t help but believe that perhaps that’s the government and military plan, when all the witnesses are gone, changes take place and progress moves on, which will leave nothing to reference back to the 1947 Incident. As a 20 year resident of Roswell I’m starting to see that happen. At times it’s frustrating, but I continue to believe that we need to continue searching for answers, even though the answers are becoming more difficult to obtain because of time, change and progress. The time factor has been one of the toughest realities I’ve dealt with concerning some of the first hand witnesses I’ve known the past 20 years, who are no longer with us. I had long conversations with many of them during the time I knew them, and am hopeful these witnesses will not be forgotten. A few I’d like to mention are Jesse Marcel Jr., (Intelligence Officer Major Marcel’s son.) Jesse and I have done lectures together, we’ve had dinner together with our wives, and he and I emailed each other frequently. You miss someone like him when they’re gone, simply because of who he was, and the conversations I had with him over the years. Two gentlemen that I had the opportunity to be around, almost on a daily basis while I was a volunteer at the UFO Museum in Roswell from 1996 until 1998, were Walter Haut and Mortician Glenn Dennis. They were both original founders of the UFO Museum along with businessman Max Littell. 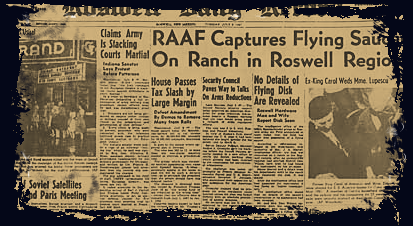 Walter was the Public Relations Officer at the Roswell Army Air Field, and wrote the now famous July 8, 1947 newspaper article for the Roswell Daily Record under orders of the Base Commander Col. William Blanchard. Walter and I had many discussions about his personal life, and his involvement with the atomic bomb group that dropped the bombs on Japan to end WWII. I was also involved with a video recording Wendy Connors and I did with Walter about his career in the military and his involvement with the UFO Incident. Mortician Glenn Dennis was the latest first hand witness to pass away in 2015 at the age of 90. I am one of the few researchers who has some slight concerns about Glenn’s account of his relationship with the military nurse at the base hospital, the 6’ 2” Captain that threatened him, and the drawing that nurse did of the alien bodies. That information has never been verified. The nurse and Captain have never been located, and the drawing by the nurse has never been found. I did a FOIA request on Glenn and got a copy of his mortician license issued from San Francisco in 1945, to verify that he was in fact the mortician. Other people I’ve met over the years no longer with us include Sheriff Wilcox’s 2 daughters; Lt. Robert Shirkey, Weights and Measures Officer at the base in 1947; Art McQuiddy, editor of the other Roswell newspaper in 1947, “The Roswell Morning Dispatch”; among several others. With my interest in the 1947 Roswell Incident since the 1980’s, I feel extremely fortunate that by living in Roswell the past 20 years, I had the opportunity to meet some of these individuals. Consequently I put more confidence in what they told me than I ever will those who have been covering it up for the past 69 years. St. Mary’s Catholic hospital on the south side of town was replaced in 1997 with a new and needed Chaves County Administration building. The Roswell Army Airfield hospital in 1947 was torn down before I moved to Roswell in 1996. Today it’s an open field on the base, and there’s nothing to indicate the hospital was ever there other than an old Air Force photograph I located. I understand the need for changes and replacing buildings, however with an event as important as the Roswell Incident, those old buildings should be remembered with some reference as to what they were, or what took place in and around them. This and future generations will never know what important events took place at those locations. With the term progress, my biggest disappointment occurred this year when the original Roswell Army Airfield fire station and military base control tower were torn down. It’s now an empty lot. I’ve not heard anything from the city why two buildings of such historical value needed to be discarded. They were some of the original buildings at the base, and are now gone. Luckily I did take a photograph of them before they were torn down. At 74 years old I also will be gone some day, and I hope that future generations will somehow know the importance of the people and buildings that were involved in the 1947 Roswell UFO Incident, and not let it pass in time, change or progress.